Many tech companies take a one size fits all approach to maintenance. We know each XS client is different. We do an assessment and then create a plan that will keep your networks and systems running at peak performance. Our dedication to customer service begins with our response time. We know the importance of having technicians on hand during all hours of the day and night. We’re on call 24 hours a day, 7 days a week. Our trucks are stocked and our warehouses are always ready for the next service call. We keep our warehouses fully stocked so we can respond to any issue. 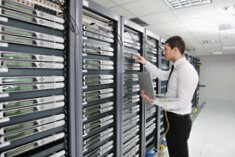 When a phone system or network is down, every minute counts, which is why we have all necessary parts on hand. We put our customers first. From our lifetime cabling warranty on installation to our dedication to first class customer service each and every time, XS Telecom is always the right choice.